Directional signs like this one would be replaced with much fancier ones under a plan being considered by CARA. Most members of Albany’s urban renewal board want to install “wayfinding signs” downtown to point out the sights. But they’re not about to pay anything close to $300,000 — which was one estimate — to get it done. 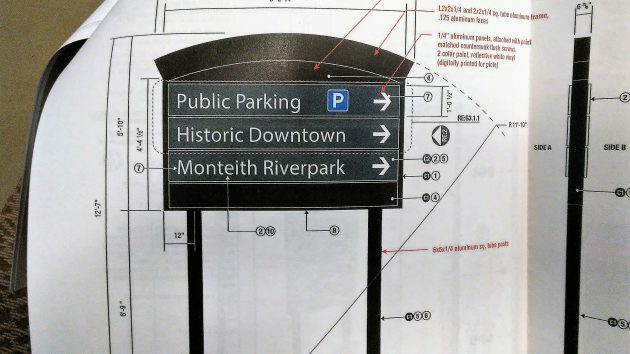 The proposal for new signage was one element of a downtown “refinement plan” from the Portand consulting firm of Crandall Arambula late in 2011. A year or so later, the advisory board of the Central Albany Revitalization Area (CARA) set aside $75,000 for the idea. But nothing happened for quite a while, until the CARA staff eventually arranged for signs to be designed. The results were presented in September 2015, and you can read that story here. Again, nothing happened for a while — until Parks Director Ed Hodney inherited the main staff function for the CARA program. Before former urban renewal manager Kate Porsche left for another job last year, there was an estimate that the sign program might cost $350,000. Since then, Hodney got a quote from one vendor that put the price at around $300,000. On Wednesday, Hodney presented alternatives that would further lower the price. But Councilman Rich Kellum, based on checking with some of his contacts in related businesses, found anything in that range to be way out of line, and most other members of the CARA advisory board seemed to agree. Councilman Mike Sykes, a business owner in his third month on the council, went a step further. Why, he wanted to know, spend any of the taxpayer’s money on wayfinding signs when the vast majority of people, especially millennials, never look at them but use their smart phones to get around places they don’t know. “Is this a prudent thing?” he asked. 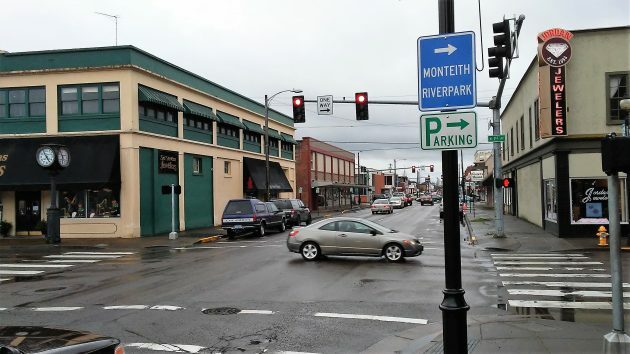 Rich Catlin, chairman of the advisory board, countered that one main point of the sign project is to make people, who otherwise would just drive through or past, aware that the downtown area even exists. A page in Wednesday’s CARA agenda shows the type of metal signage being considered for downtown. Councilman Mike Sykes is right on target. But, it’s not just millennials that use their smart phones to get around places they don’t know, people of ALL ages do the same. I’m 64 and a perfect example. Our city council: wasting time, wasting money. This is so totally unnecessary! Our tax dollars need to be spent on some of the rough streets! Signs on light posts would be good enough!! The only way TIF works is if property tax revenue created by a project generates an increase over that generated by the existing use (or non-use). If CARA can’t show how spending property tax money on signage will result in increased future property tax revenues, then CARA commits fraud against Albany taxpayers. Let me guess….return on investment was never mentioned in the CARA meeting. CARA is a fraud. If Albany taxpayers can’t see this, then shame on them. I had a discusion with a gentleman awhile back, that was running for the city council . Over the years I have had the same discussion with other acquaintances. Throughout my travels in many European cities there is a recurring theme, central prominades or plazas, if you will, where people gather during the day and after work at night. It is a place where craftsmen can sell there wares and street performers entertain. These plazas are usually located in the city centers. If everyone is so concerned about “revitalizing” downtown Albany, close 1st Ave to vehicle traffic from the Ellsworth street bridge to past the new Carousel building, allowing side street traffic down to Water street for prking etc. There can be stanchions (that can be dropped or taken out to allow for deliveries or emergency vehicles) that block the street from block to block, allowing for side street traffic. I believe this would add to the draw of the carousel too. This would be a downtown area I would come to on a regular basis and I believe others would too. Just my opinion. Interesting idea. I like it.